In this richly illustrated picture book for middle-graders, the Greek gods and goddesses are served up to kids a la comic book superheroes. 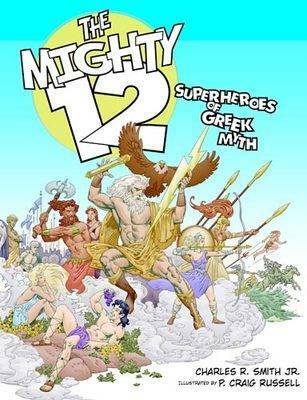 In a perfect fit of topic and art style, and a seamless blend of ancient and contemporary sensibilities, the key characteristics of each of twelve major gods/goddesses of Greek myth are delivered via Charles Smith's accessible, stylish poems, while P. Craig Russell's vividly-coloured comic-art-inspired graphic portraits draw the reader in. This innovative introduction to the classics boldly sets itself apart from the typically bland stand-bys. Teachers and parents often clamour for anything that makes such topics - as well as poetry itself - more accessible to students, and THE MIGHTY TWELVE is just what they're looking for!